Most settings need a Rocview restart to become activated. Multi window view (MDI) → Deprecated: Use AUI instead. The widgets width used on the Loco Widgets Panel. The buffer size of the Server and Controller monitoring windows. The default is 4 kB and ranges from 1 to 16 kB. Smaller buffer sizes will reduce CPU load and is advised for normal operation. Bigger sizes can be helpful reading the analyzer startup check. The area of an icon in the toolbar (min. 24). Increase to get a better usability with Touch screens. If the default track plan size, 64 x 48, is not big enough for the target layout it can be adjusted with CX/CY which represents the number of symbols horizontally and vertically. Changes will first take place after restart of Rocview. If the default module plan size, 128 x 96, is not big enough for the target arrangement it can be adjusted with CX/CY which represents the number of symbols horizontally and vertically. This is not officially supported and could lead to a server crash. Disable it if more control is wanted when running in auto mode, but is not recommended. Attention: Not all changes may have affect on the fly; some changes need a server restart, and some will desturb auto mode! Enable Gamepad Support. Some systems will loop if no device is attached, uncheck this option if such a behavior is encountered. Check this option if you want the "dispatch to throttle" function in the mode column of the loco just under the left mouse button. Activate this option if you want throttles opened on exit of Rocview to be restored in the next session. Activates command station and server monitoring. The amount of information presented is depending on the Trace Level. Note: The Trace Level has to be Monitor in order to show the commands executed by the command station in the accordant window of Rocview. This option should be disabled in case of Rocview getting slow on user interactions. In most cases it is advised to disable this option to avoid queue overflow which will freeze Rocview. This option shows only schedules in the context menu of a block in which it is the first entry in a schedule. If not set only the first 40 schedules are listed. This option shows the ID in the block symbol. 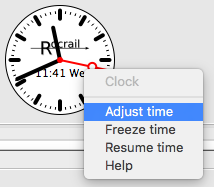 Uncheck this option if the clock secondhand is not wanted. This will also save CPU load. If multiple Clients are connected, and the Server must be restarted for some reason, this option prevent Rocview from also shutting down and tries to reconnect with the same server. The sequence is the same as doing a manual "Go offline" and trying to connect to the same server until it succeeds. Reset the loco speed to zero incase of a direction change. Redering using the "GraphicsContex" engine with antialiasing. + Looks better if the layout is scaled down. + Turntable looks much better. - Needs more processor resources. - Many Windows Versions do not fully support it, incl. 7. The default setting is: No smooth rendering. Opening workspaces with special characters. Move the Toolbar from top to the left side of the Window. Under Linux/GTK the toolbar is in both positions floatable/dockable. Mac OS X inverts the check toolbar items → wxWidgets/OS X Bug. To enable/disable the Loco image on the Loco tab. To enable/disable the Train image on the Loco tab. This option will activate horizontal scrollbars in the server and controller monitor windows to prevent wrapping of long lines. Shows the Speedometer on the Loco-Tab Throttle. With the option deactivated (default), the speedometer shows the speed that Rocrail calculates from the selected step. If a locomotive decoder can report the actual speed of the locomotive via RailCom, the speedometer displays this speed value if the option is activated. 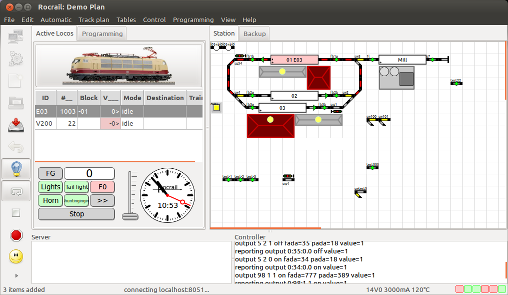 Shows down scaled loco images in enter and occupied blocks. Shows the train ID in the block if the Loco has one assigned to it. The checkbox is of type tri-state which can be used to disable the loco ID if set in the undetermined state. Use gray icons in the toolbar instead of coloured once. The background option maybe be disabled in case of a 'Dark' Desktop Theme. Group toolbar icons with separators. Activate the Sensor Monitor also in automatic mode. Sends the selected loco a Pause command after clicking on the throttle stop button. Some dialog do not fill its index when it is opened with the context menu to speed up dialog initialization. If the computer and OS are fast enough, it can be overwritten with this option. Use monospace font in the Server and Controller window. Show tooltips on the loco throttle to see the function description. Show the car tab to be able to assemble a train with D&D. Show the train tab to be able to assemble a train with D&D. Show the car image on the car tab. Restore the size and the position of dialogs. Opens the object context menu on double click. This can be used for touch screen support. Automatically opens Timetable windows on a Location publish. The value on the right side of this option is for setting the cell spacing in the HTML table. Object mnemonic plus a continuous number (e.g. "bk3", "fb15", "seltab1" …). The "-" must be defined as a part of the Symbol prefix. The automatically generated ID will be set in the object directly. With the objects its properties dialog this ID can be changed at any time. The ID dialog will popup with the proposed generated ID. This proposed ID can be used as is or directly overwritten with another ID. Use the (under Windows scaled) selected symbol as mouse pointer in case Rocview is in edit mode. D&D from the Add item dialog will not function with this option; Just select the wanted symbol, and move the mouse pointer on the plan. A click on the "X" button in the Add item dialog will reset the selected symbol. The escape key, or right mouse click, can be used also in case the plan window has focus. This could be annoying and can be deactivated with this option. Colors the Loco Tab Grid cell background under certain conditions. Copy the complete Rocview configuration to the clipboard.